This pillow was a win for me with the back and neck pain I experience. I have tried numerous contour pillows and have about 5 of them, and this one is by far the most firm. It holds it shape and stays very high so if you need/prefer that type of support, this is the right choice for you. It also has a cool gel coat across the top which stays cool while you sleep. I gave it 4 stars because I occasionally switch back to the softer contour pillows because of the extreme firmness. Conforming memory foam is paired with cooling gel material to provide you with support, pressure relief and temperature regulation. This ergonomically designed pillow provides support for the head, neck and shoulders to relieve sleep pain and align the spine. Cooling material in the foam captures and distributes heat for a cooler memory foam. The result is a cooler, more restful sleep with no neck pain. This molded, high loft pillow effectively conforms to weight and pressure, creating ideal support for back and side sleepers. Plush pillow is soft and thick with a 4.5 to 5.5-inch loft. For a clean, comfortable sleep surface, the pure cotton percale cover can be removed and laundered. Due to the nature of foam the firmness level of similar products may produce different firmness results. I purchased this pillow because I have a chronic neck problem. It’s so soft and comfortable and fits perfectly under my neck when I lay on it. The memory foam doesn’t go flat while you sleep it forms to your neck for support. Highly recommended!! I am the pickiest when it comes to pillows. I have other products from this company and thought I would give it a shot. And I wasn't disappointed. This pillow has changed the way I sleep! It has amazing neck support without being hard at all. My head is cradled comfortably and I sleep soundly. I haven't had this good of sleep in while. This pillow is worth every penny and even more! Thank you for another quality product! I ordered this as an extra pillow to use in my living room while I'm sick this pregnancy. I'm always so sick the first trimester I can barely move, and yes, going to get my pillow out of the bedroom is a hassle. This pillow comes with a cover on it, which is extra nice for me, because I didn't need to buy a pillow case. It comes rolled up and takes about two days to completely "inflate" or whatever you might call it. It seems to be very good quality. It is not super soft but also not very firm. For my sleeping pillow, I prefer a firm pillow. I mean a rock hard pillow. Everyone complains my pillow is like a rock, so for most people this is probably as firm as you want. But for me laying on the couch, I prefer this one. It is softer and I can move it into different positions as I need to and I like that. Once I'm over my sickness I may replace my extra pillow on my bed with this one because it is much nicer. I love this pillow!! It's firm at first when cold but softens up and molds well from your body heat. It's also cooling. It has helped my back and neck pain tremendously! It also did not have an odor to it like many other pillows like this, which is awesome. Definitely recommend!! Yes, I read the reviews and that’s why I decided to buy. All those people who praised this pillow must have gotten a different product than what I received. I let this pillow sit for 3 full days before I used it and it never reached a size where it filled up the case that came with it. It is way way too soft and offers NO support!!! After laying on it less than a full minute, it goes maybe 2 inches or less in thickness. The pillow I recieved must be a knock off. What a waste of money!!! I DO NOT RECOMMEND!!! I would like to withdraw my previous review now that I’ll had this pillow longer. I have to say it took about one full week for this pillow to fluff up. Now that it has, I starting to really love it. And I would recommend!!! Love this pillow! I’ve tried all the ‘cooling’ gel pillows and have not been happy. This one did not disappoint. It puffed up in one day. (I tossed in the dryer to fluff it up faster.) It’s super comfy and just the right loft. Squishes down just enough while still providing support. Comes with a nice cover as well. 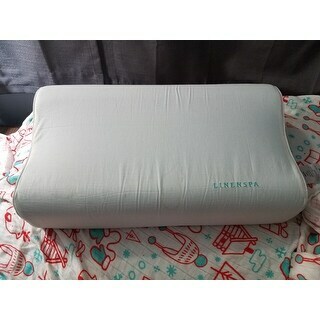 Had a problem with pillow not fluffing up...e-mailed linenspa customer service and was given instructions that worked just fine. Does take more than 24 hours so be patient. Great customer service....would definitely buy again. Offers good support, but is very hard. I like this pillow, because it doesn't go flat. I need my head to be elevated higher than most people, and its great. Kind of small, width wise, but overall a great pillow. Super comfortable! I could not wait to try this and when it arrived i immediately had to take a nap and test it out. Best nap ever! 5 stars completely well deserved. I cannot sleep without a contour pillow and was very excited to see that there was a thicker version out there. It took a few nights to get used to the difference and I really like the difference. I wish it was a little longer though. This pillow looks like it will give me good neck support and we’ll as my back. The ratings were also very helpful because I’m looking for a Moe firm pillow that doesn’t go flat! So we’ll see! I'm hoping it will be a firm pillow as that is what I need and want. It was the only pillow listed as medium/firm.